I just come back from Rome where I represented South Africa with Cardinal Napier with the Synod of Bishops in Rome. It was, I will explain it as we go to the programme today, a very energising experience but also a very heavy a time of study reflection and listening to interventions from so many people. I’m so happy to be back in Pretoria. This Sunday I’m just reminding the people of Pretoria, we open our Year of Faith at Pilditch Stadium. People will begin to arrive from 8:30am on. The programme starts at 9. It will lead up to the mass at just after 11 o’clock and the program should be completed by around 1:30. There will be many interesting items in the programme in which parishes will be given a candle for this whole year. Families can acquire a candle; individuals can acquire a candle, too, in order to remind them to make this indeed a Year of Faith. So people of Pretoria and around, are welcome to Pilditch Stadium this Sunday from nine o’clock on. Fr. Daniel Giacometti, Stigmatine father, has produced a very nice booklet and hopefully it will help you during the year. I just come back from Rome from the Synod and I’ve spent four days in my home country of Ireland on my way to Rome. I went there because it is 50 years this year since I wrote a matric, which reminds me that we are certainly praying for all those now as it were up to their ears, in exam questions and are worried about what’s coming up but now they have done on some of the papers. We are praying for you, young people, we are praying for you. 50 years ago I wrote a matric. There were 80 of us in that year in the boarding school. And 50 years later, during the beginning of October, I met with them those who are still around. 80 wrote a matric, 20 are now dead and some we couldn’t contact and something like 45 or 50 were present. We had Mass and meal and great memories of the time we had been together in that boarding school in that college in Ireland. Today is a special Feast Day of the Church. It is the Feast of all Saints. Indeed, in our time in Rome we saw the prominence of new Saints. When he opened the Synod and the Year of Faith, Pope Benedict spoke about two new doctors of the church. The Doctor of the Church is a teacher of the Church. There are thousands of Saints but some of them are famous for their teaching ability. All Saints are from all categories of people. Some of them were illiterate, unable to read and write, but others were really wonderful theologians. During the Synod Pope Benedict raised Hildegard of Bingen as a Doctor of the Church. She lived a thousand years ago, more or less. She was a German Benedictine Sister who wrote extensively on a whole range of subjects. He held her up as a witness of faith with her. She was of the 12th century. And from the 16th century, the Pope spoke of St John of Avila, also a writer and reformer within the Church. Now during the month of October also the Pope canonised seven new Saints. Father Jacques Berthieu, we would say is somehow connected with Africa, a French Jesuit priest was a martyred in Madagascar and died there at the end of the 19th century. In the 1890s he was spreading the faith in a time of warfare and destruction, and he himself was killed then in the faith. He was the one who was a close contact with Africa. Another beautiful story also of St Maria Anna Cope born in Germany but grew up in the United States became a sister and she is the one who took over from the famous St Damien of Malachi the leper priest who left everything never to come home again to work on the island of Malachi with lepers who had been totally abandoned. Maria Anna sent her sisters there to help Father Damien she went with them but they refused to stay unless she remained with them and so she remained with them and lived and died there. She promised that no sister in her congregation worked to Malachi would ever get leprosy and it is true down to this day no sister has ever got leprosy. There was a Spanish Sister, Maria del Carmen, famous for her charity. There was an Italian priest, Giovanni Battista Piamarta, from the North of Italy who established a Catholic printing and publishing house in his native Brescia, and there was also the famous and “Lily of the Mohawks”, Kateri Tekakwitha. The Mohawks as you know are the North American people tribe and she became a Catholic to Jesuit Missionaries and was a fantastic example to our people suffered so much, but a person driven by fantastic love for Jesus Christ. And there was also for youth, Pedro Calungsod, a young Filipino saint who was a catechist, and who died in order to defend the priest he was travelling with. He could have escaped but he stayed behind when the priest was under attacked to defend him and got killed for his trouble. So these are new saints, new models, and new examples for us to inspire us in the faith. As you know this next weekend the 10th and 11th of November, we will be celebrating as it was some of our own Saints, when we celebrate 150 years of the Church in Lesotho. Gerard Tlali Lerotholi, the Archbishop, was with us in Rome and he spoke about that and the plans they are making to celebrate the arrival of Ntate Gelata and the Bishop who went with him to Lesotho and established there in Romahamama the first Catholic mission from which grew up the wonderful strong Catholic Church of Basotho, of Lesotho which is today of course, is so strong in Lesotho. It has done so much for the hospitals, for the schools the education of the people, which established a college which became the University of Lesotho. In fact there many parts of South Africa we owe our faith to those missionaries who started off in Lesotho and to the Basotho people who became the first Christians down there. All the Free State must speak very influenced by the Catholicism of Lesotho all-around Johannesburg when I worked in Sebokeng and all those places around they are and many famous people from down there. The Catholic Church owes so much to the Catholics who came from the Lesotho also here in Johannesburg and Pretoria, so we celebrate out with them. What is Synod? First of all, it is the meeting of the Bishops representing all the Bishops of the world. You have two things: one is a Council of the Church. A Council of the Church is where all the Bishops of the Church meet together. The last one was 50 years ago, 1962 to 1965 where 3000 bishops met in Rome, that is all the Bishops themselves went to Rome and met with the Pope and for three years’ and some part of four years, at least for a few months each year, discussed what were the 16 documents issued and giving guidelines for the life of the Church today. That was the Council of the Church. Now the Synod, one of the outcomes of that Council was the idea that for the on-going and organisation and advice in helping the Church to grow and that there should be a Synod periodically. This was the 13th, I think, since 1965 in the Council. This Synod is representing the Bishops of the world; there were 255 Cardinals and Bishops present. It was on the theme of the New Evangelisation and the Transmission of Faith. It comprise of about 350 people were present in all. And from really around the world! From Bishops you would never meet otherwise, from Iran, from Iraq, from Turkey, from Pakistan, from Cambodia, from Vietnam, from Korea, from Siberia, from Russian, from New York, Ukraine, from all the countries of Africa, all the countries of the Americas, and Europe, and so on most of the countries Asia. So it was a very very interesting experience. There were 439 interventions, by intervention I mean as Speakers. You’re only, fortunately, given just 5 minutes you would have liked and speak at greater length but you know when you hear someone’s interventions you’re happy they were short. If you went on there for seconds over the 5 minutes, the microphone would be switched off. But to listen to 439 interventions was heavy. And then we had to draw those substances of those interventions, into what became the 14 main issues or questions or propositions, if you like. And these then were now taken to smaller circles or language groups. There were 4 English-language groups, for example, there were French language groups, Italian and German, and Spanish course, language groups. In my particular group there was a South Africa, the Bishop from South Sudan, Bishop from Bangladesh, Bishops from India, from Zambia, from Malawi, from Australia, from New Zealand, from England, from Ireland, from the United States, and also representing the Methodist Church was Bishop Susan Davis who spent four years as a Bishop of the Methodist Church in Lesotho and South Africa quite well. She is actually from the United States and works out in the West Indies. There was also a professor from one of the major seminaries in India, a lady, and also the Filipino Catechist lady who is responsible for the National Youth Programmes of the Philippines. Now these small circles then had to take these 14 issues and remember what was said in the hall and try to formulate some principles that would become maybe proposals for the final and issue. There were some 400 proposals and these then were co-ordinated down to 60. Then the circles met again, we had the last chance to change the proposals and then we voted on them and they were formalised. And these have now been issued. I will look at some of the reasons why this Synod was called, and later on maybe some of the outcomes. The theme of this Synod of Bishops from around the world was the New Evangelisation for the Transmission of the Faith. Now I think first of all, there are two important words there: there is Evangelisation and is Faith. We can ask ourselves the new evangelisation for the transmission of the faith, Why this theme? Well, there are two reasons; there are two headings to give an answer to the question why was this theme chosen for the Synod. FIRST REASON FOR THE THEME: JESUS HIMSELF. First, is that of Evangelisation, Evangelisation as you know is the encounter of the individual with Jesus Christ. So that’s evangelisation itself. The very first evangelisation of course, was Jesus himself. Jesus the Son of God became incarnated to become flesh to become human in body, soul and mind. He became one of us. He was the Son of God and God; he was born and lived among us. He came to teach us by his behaviour, by his life, by his instructions, by his death and resurrection, and through that he made us children of God. Perhaps let me say this and try and compare Jesus to a great bonfire. A bonfire is a huge fire, we might light out in an open place if were celebrating at night we all gather around that bonfire. So in the darkness of our existence, Jesus is that great bonfire burning brightly and beautifully and we are attracted to that bonfire. As we read in the Gospel were people like Peter and James, and John the apostle. People like James, people like Mary Magdalene, people like those who came faithfully to listen to Jesus and who believed in him, and thus, by believing in him they were prepared by him to catch fire. And in fact, with his death and resurrection and ascension and with Pentecost, Jesus set that new bonfire on fire! The new bonfire is the Church which has been burning for 2000 years, generation after generation. But there are moments, I suppose when we have to admit when we look at history honestly when the fire seems to cool, when the embers are hidden beneath the ashes. But from the embers always in the history of the Church, the Holy Spirit makes that fire blazed up again and makes the fire of the Church as if were to take on a new lease of life, to take on a new energy, to take an annual ardour, new power, a new strength to go out into the world again. For example, in the first three centuries from 300 years more after Jesus that fire burnt and converted the whole Roman Empire which was all North Africa, all the Middle East, all Southern Europe, and beyond was in sense, the message of Jesus Christ the light and the fire of Christ was brought to those peoples in the first three centuries. Then we had another explosion of that great bonfire, of that faith and of love when the Celtic, the Anglo-Saxon, and peoples were converted to Christ maybe from the 5th to the 9th century, to the 7th century after Jesus. Again we had a conversion of the Slavic peoples, that’s all those peoples of Russia, Polland, Czechoslovakia, Yugoslavia, Romania, Bulgaria, Ukraine, all those peoples in the 8th to the 10th century. They came to Christ in a new outburst of apostolic zeal and preaching of the Gospel. We remember the ardour of rekindling of faith from the 11th to the 14th centuries, when the Catholic Church started schools, its monasteries, and ultimately the universities. Some of which we know so well today. 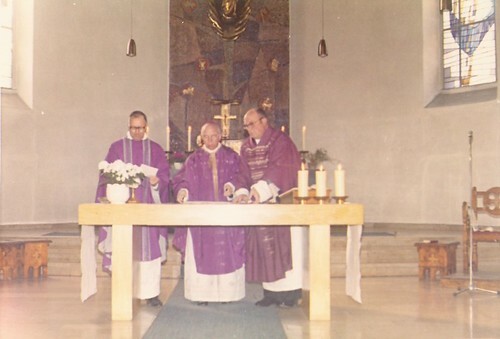 The Pope pointed out that Vatican II, that counsel of the bishops between 1962 and 65, was in another as it were blazing out of the new fire of the Gospel. But this fire continually needs new branches, new timber, and new glowing coals. So the New Evangelisation called by Pope Benedict and mentioned already by Pope John Paul II but called this Synod now of the New Evangelisation is the effort of the Church today to rekindle that fire, to start that ardour, that burning zeal once more. To go back into a world that is getting tired, that somehow fails to hear the Gospel and to go back make ourselves, as it were to the power of the Spirit of course, convinced in faith and witnesses of faith. So therefore, this Synod in Rome during this month of October was the call, was a challenge to all Catholics and to all Christians, to all representatives of the other churches there to be ignited, to be on fire, to catch fire again, to go back to Pentecost, to experience their own Pentecost. As individuals, as families, and Church so to be on fire with faith and love that we may transmit the faith with great faithfulness because the world waits for that faith. The first reason then, the first heading as it were of reasons why the theme the “New Evangelisation for the Transmission of the Christian Faith”, the reasons were that we need to continually relight that bonfire that is Jesus risen from the dead and his Spirit present among us and present in the Church. However, there is a second number of reasons which may become a more negative point of view. There are many changes in the world today. People are asking even fundamental questions about the meaning and value of Christianity itself. The world has become so fast and so radical it’s like that there is a tsunami as it were of cultural experience sweeping the world. And this often offers us a high change to our Christianity. Changes for example, we in South Africa at least the half of us who are alive who could remember 1989, when the Church brought out the First Pastoral Plan that’s only 23 years ago but half the people of South Africa were not yet born then. But half of people in South Africa from today do not remember 1989 and the change that has taken place in our country since 1989, 1990, until today is huge. So this is a demographic change, new generations have risen up and risen up in a world that its culture has changed radically and it so difficult today to speak about the faith because we don’t have the strong bonds of culture anymore. No more strong bonds of family, strong centres of Christianity anymore in which young people can embay that faith with the same clarity as the older generations were all able to do in a more simple and unified culture. Another thing about our world today is there is a growth of secularism. Now people speak a lot about that. What does it mean? Well, Secularism comes from the Latin word secula which means time or this world. Secularism is really a belief that there is nothing beyond this world. There is only this world. Many people today live lives practically without any reference to God, without any hope of a transcendent of an absolute of anything beyond our God. So they don’t say that they don’t even think about these questions but they live as if there was nothing beyond this present world. So we have a silent (as the Pope said) “a silent apostasy”, that is a lot of people who have lost real contact with Jesus and his globalisation in our world today which means that we’ve become a village. The experience of other religions, of other cultures, of other histories, of other countries has made the story of life today much more complicated. There is much more disparity between rich and poor today. A visitor coming to Johannesburg or Pretoria would be struck. Say in Pretoria, it’s a city of schools and universities of students, it’s a city of big business headquarters, and it said the city of the administration of our government. It’s a city of diplomats. It’s a city where a lot of wealth is displayed and it’s obvious. And yet in the census, as South African census just released which President Zuma received two days ago, we read that in Tshwane District there are 800,000 people who have absolutely no income. Can you believe it? 800,000 the best part of a million people in Tshwane today have no income! And yet the visitor in a tourist bus driving around Pretoria would be convinced as he went back to the airport that this was a wealthy city and yet if hundred thousand people and had no income and of course another couple of million and a very small income. So there is a tremendous difference between what the rich earn and what the poor earn. This is twice as bad as it was 10 years ago in the last census. And that gives rise to social unrest, to despair, to poverty, to unemployment. People in the world today are anxious and so the Synod is an effort of the Church to embrace people to dare again to speak the word of God to them, to remind them of the salvation love of Jesus Christ waiting for them. We know it ourselves that people do slip away from the Church after confirmation. In Europe it has reached catastrophic proportions many of the mainline Protestant churches are almost dead in Europe today. The Catholic Church in countries has lost many members even though it has very good centres of apostolic life there is still a lot of loss to the church and to the faith. Another trial for our Church is with the weakness of our own faith in our own example. The abuse that has taken place, not witnessing. People don’t see a difference between a Christian and a non-Christian. It is not obvious in our lives. So how can we renew that great weakness of the modern family? These two reasons of the Synod were called first of all to invite people to have confidence in the faith and to rekindle that great fire in the Church which is the presence of the Spirit of God. To be touched by that fire and become witnesses of it. And secondly, the world today is thirsty. The world today is in a desert. Many people today are a _______, many people today are despairing about the future specially many young people. Those many people in the world today who are unemployed and will never be employed there is a growing number of poor people. So a Synod is called then to say, “Place Jesus once more in the middle of our world”, and then we will hope to rekindle the sense of Pentecost and the fire and zeal which send out Peter and his friends to convert and bring the world to Jesus. The reflections in Rome and have given rise to certain proposals and hopefully to reignite that light, that fire, that warmth of Jesus Christ in our Church today that we may have confidence in going out into the world with that message. I have spoken about what Synod is. 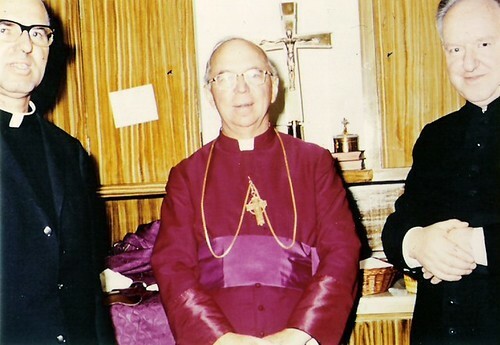 It is a meeting of representatives of Bishops Conference of the world. Meeting with the Holy Father, the Pope was there each day when there were interventions and listened to all the interventions and he will draw up a final document perhaps that will come out next year to give us the full fruits of those reflections together. However, during the sessions itself the bishops having listened to each other and shared, drew up a message which will give something of a flavour of what the Synod hopes to achieve and what it says. Referred back to something what Pope John Paul II himself spoke about when he spoke first about this New Evangelization, the need for a new encounter with Jesus. Because many of us got tired, we’ve lost contact with the Lord. So he spoke about the new ardour, the new methods, the expressions. But now it’s mainly ardour, of fire, of energy that will come out of this Synod. The methods and the expressions, this will hopefully develop out of a new encounter with Jesus. There is a book called “Surprise by Joy”, by CS Lewis and when you say, hopefully, that we wanted the gospel to become alive in the world today, you cannot lay down beforehand an absolute program of what is actually going to happen. There is always a surprise when we spend time with God. We are surprised by joy, we are surprised by a life, and we are surprised by goodness. And so the Synod will not give us an absolute and workout program and of step-by-step what we are going to do but it can highlight as some of the ways that we can investigate in order to make the gospel of Jesus alive for our brothers and sisters today. Now in the message which came out during the Synod, you will have it on your internet and in the newspapers like the Southern Cross and other newspapers would have carried something of it. The message speaks begins by going to St John’s gospel Chapter 4. You remember it’s the day Jesus met that woman beside the well of Samaria. The message speaks about this woman came to the well outside the city with an empty bucket. She came thirsty looking for water. And it went on then to reflect on life today in the modern world that there are so many people are thirsty, in a sense, all people are thirsty because only God, only Jesus who can satisfy us. Other things can lighten the burden of life or satisfy us for a while but ultimately the Synod is very much based on the concept that to be fully human we also have to understand that deep within us we have a spiritual dimension, a spiritual thirst. And only when that is satisfied does the human heart find real peace. So we are like that woman beside that well and Jesus is there and he begins to speak to us. The message warns that there are many false wells. There are many toxic wells in the world today. And we know that, when people get drawn to the ways of life: violence, corruption, drugs, on redeemed sexuality, etc. Where people who get drawn to a way of life that dominates their lives so they become slaves of power, of self-interest of themselves therefore unable to never to really fully appreciate life. The message carries on saying yes, so we have come to Jesus and we are thirsty. The task of the Church is to provide wells, to provide fountains in which make Jesus present because it is he who gives a salvation and full of joy. In this story in John chapter 6, it is Jesus who read the depths of the woman’s human heart. It is he who understood her experience of life without her having to explain it in detail. And the message says that we as the Church today must sit beside the people of today, we must sit beside him. This was very much emphasised in the Synod. We can use the media, we can use preaching, we can use all kinds of new strategies and programmes and workshops but the greatest means of evangelisation is personal contact; person to person. And so we need to sit beside the person – the people of today. Many are lost or are losing their way, and this is the task of the Church, to provide people with wells. The woman you remember asked herself or maybe also the people in her village, “Could he actually be the Messiah?”, she in other words went back to the village. Again the message draws out this action of the woman that is having been touched by the Lord herself; having been amazed by the goodness she experience in Jesus; by the sense of He fully and totally understood her; she had to share this with others. So the converted sinner which is you and me as much as the woman in Samaria, we must become the new messengers. Anyone who encounters Jesus cannot but proclaim Him. And so the Council appealed to the priests, appealed to the bishops, appealed to the catechists and deacons, to all religious, to families, to every individual in the church, that if you are to be effective in bringing the fire of God into the world – spend time with Jesus. You must meet him personally. You must have a time when you and He are almost alone and when you share that sense of friendship then and only then can you become really a springboard or a fountain for others to experience Christ. So our task, as the message says, is to lead all to Jesus. Next weekend as Ntate Gelate Leratovi has invited us the Archbishop of Masehu, will be celebrating the 150 years of the Catholic Faith in Lesotho and from Lesotho in many many parts of South Africa. A big part of that is due to the courage and perseverance of Blessed Joseph Gerard “Ntate Gelata” who came to South Africa in 1854 never to return home again. He lived 60 years out here, 10 years in Kwazulu Natal and the rest of the time (50 years) in Lesotho, in the mountains, the horseback Mikaeleng, Hamama, up in Leribe, in Santa Monican and the other mission here. It is because of a fire. The people used to refer to Fr. Gerard, because sometimes they might have not remembered his name but when they go to the mission they would always ask for the priest who always prays. And clearly this is the message of the Synod that, like Fr. Gerard, if we are to be on fire in Jesus and we want to share his message then that comes from the Spirit of God which we meet when we spend time with Jesus. So the Church then is to create wells, is to create space – a well, a time so that people can be with Jesus. Another image used was the image of Oasis. What is an Oasis? Oasis is when you go across a big sandy, barren desert you suddenly find a cluster of trees around the fountain that is an oasis. So the Church is a well, the Church is an oasis which brings Jesus to people. I have just gotten back from Rome. It’s nice to go there. One secretly hopes that the Lord’s presence will be there for one and that it will be a very special and spiritual moment and indeed to go to the shrines of the great saints, we remember where Peter and Paul walked these streets is indeed a moment of reflection and a moment of spiritual enrichment. But always after a few days in Rome I have come to the conclusion that I am closer to Jesus at home. And this came out to me even more clearly; on Sunday at the closing mass of the Synod we took the gospel which you had here in South Africa and all over the world. The mass was celebrated the gospel from Mark of Bartimaeus, the blind man sitting beside the road in Jericho. That man was blind, was a beggar, sitting beside the road, the Pope spoke about him at length in his sermon. And this Bartimaeus did not have to go to Rome to meet Jesus rather he called out and Jesus said, ”Bring him to me” and they brought him to Jesus and Jesus said to him, “What can I do for you?” and Bartimaeus prayed, “Lord, if only I could see.” And Jesus immediately cured him and he followed Jesus along the road filled with joy. This brought home to me that Jesus is met in the simple moments of life. And this beautiful story of Jesus as it were bending over the poor blind beggar from whom he can’t expect nothing in return reminds me that we have many many moments like these in our life, we too can reach out to others. The secret however, of meeting Jesus in these moments of life which continually is happening in your life now, today and every day is to have faith in these moments. To know that Jesus is risen, he is alive and he lives in you. And when you go to that poor person, when you’re bringing the Lord to him, if you could be conscious of seeing Jesus in the poor person. In fact the message of the Synod the Bishops will say that the poor person is a special place, a special shrine where we can meet Jesus. So this evening, dear mother, dear housewife, as you prepare food for your children, do so with love as if you were preparing it for Christ and you will meet him there – you will find a new peace in doing that. If you are a man coming home from work today and have worked hard, you are bringing home something for your children, you are bringing home yourself which is the most important thing of all in kindness and care for them do that with Christ and you will find a new strength and faith in life. You who are nursing, giving out medicine to the poor, the teachers who spent over the kids specially the slow ones today, who have pity on them and is trying to uplift them. The entrepreneur who is making work an opportunities for others; those in the media who are trying to bring a message of knowledge yes, but of hope and joy to others. Whatever you are doing, the taxi drivers.. in whatever caring profession you are involved in – you are Christ! And you are meeting Christ in that encounter. You don’t need to go to Rome; you have simply to go into your own heart to know that Jesus is with you. So reflect on this today. Invite the Lord to be with you. If you can bring him into those moments of life and surely you will meet him there. And those moments will become special moments; they will become the shrine, the space where Jesus is alive and you will set the world on fire slowly but undoubtedly true. Sharing something out my experience of the Bishops Synod in Rome in the meeting of representatives of Bishops from all over the world to look at the New Evangelisation which is indeed helping people to encounter Christ and also to encounter him ourselves and then how to pass on this faith, this living relationship, this living encounter with Jesus to others. This is what we were considering and I’m looking at the message that the Bishops send out during the (it’s not a final statement), it is simply a message to people pointing out that we are like the Samaritan woman beside the well; that the Church must provide wells – spaces or oasis where people can quietly meet Jesus today. We have to do this in a world that is rapidly changing and in a special way this is the task of the Church. Speaking about our communities and about the Church, in a message, the Bishops went back of course to the beginning of the Church, to the Acts of the Apostles, to that first community filled with an ardour for Jesus, people who would have known him, people who have experienced the coming of the Holy Spirit upon them. As we go back to Acts chapter 2 and find our examples there. 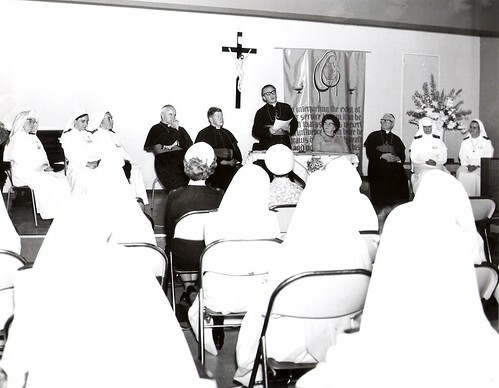 We must re-enkindle the communities like that where they shared a Word of God; where they listen to the teaching of the Apostles; where they broke the bread that is celebrated in the Eucharist together; and where they showed great love for each other; that is as it were an ideal picture, an ideal position to which we must retire, to where we must rediscover and make it part of our lives so the people will say, This is the great witness!”, “See how these Christians – these Catholics (for example: this parish, this small Christian community, this family, etc.) love one another!”. That is what draws people. People are drawn by love. So it’s not a matter of imposing anything. It isn’t a matter of inviting people to give them wells where they, too, personally can meet the Lord. The New Evangelisation (this may be a bit abstract to you) but it is not in the first instance about new methods as if we were working out new markets strategies because the world today is always talking about brands and getting new markets, new strategies and success, new finance, and that. This is not the New Evangelisation is about. In fact, the strategy that we as Christians should employ in our faith is the “how” of it. It must be learned from Jesus. In other words, we must go to the gospel and see how Jesus himself evangelised. See how he met the Apostles at work fishing beside the lake; or at the tax table collecting money in the case of Matthew, and so on. See how Jesus met and spent time with people. One of the bishops said, “You know sometimes there are priestly ministry, our parish ministry is a question of ‘hit-and-run’. We are ‘hit-and-run merchants’”. In other words, we go out there and do what was supposed to do and get away as fast as possible. No, no, no, Jesus spent time with his Apostles. Time and time again as it were with these Apostles; in lonely places, in quiet places, on the roadside, in his miracles, and during the night at prayer he was with the Apostles. He was with the people at table; he was with people in their suffering; he was with people wherever he found them; and he spent time with them. This is the great strategy, as it where to bring the gospel into the lives of others today; to spend time with them; not become involved in empty ritual or liturgies that are soulless and of no religious atmosphere. No liturgy, of course, is absolutely essential but they must be filled with a sense of the presence of Jesus. So how did Jesus meet people? Look at how he met the Apostles. Look at how he met Zaccheus, the man who climbed the tree. Jesus said, “I’m going to stay with you tonight, Zaccheus.” Look at how he met the Roman centurion who went home with them in Capernaum to cure his servant; and how he met the blind man Bartimaeus (from last Sunday’s gospel); how he went for hospitality to the home of Mary and Martha in Bethany just outside Jerusalem, etc. and so on. Jesus met people where they were, and that is where the real evangelisation takes place. That is where people rediscover the Word, where people are converted in a personal way and where they experience the Holy Spirit. Yes, the message goes on to say we are not blind to blindly optimistic. We are in a world which has a lot of evil. It is obvious to anyone. There was a lot of evil violence and abuse in the world but we are not intimidated. Jesus has overcome the world! Yes, you are down at the moment; yes, you are depressed; yes, you are stressed, but Jesus has overcome the world. Go to him and maybe he will not give you the money you need immediately; maybe he will not give you the health you need immediately; but if you need him in your need for money, if you meet him in your suffering today – things will change. You will have a new strength; you will have a new hope, a new energy. This message goes on specially to underline the importance of the family. It is the natural home, the bishop say, of the new evangelisation. In other words, it is the first time and primary place for people to meet the Lord. Here the women have a special role and also the men choose the importance of the grandparents – you all have a very important part to play. And the Church must do all its part to protect marriage. However, we know that many marriages are broken; that many people who are living in broken relationships, but do not feel excluded by that. We may not be able to receive the Eucharist but come to the Church; you have a lot to give. You can do a lot for Christ. You are welcome and we want you in the Church. 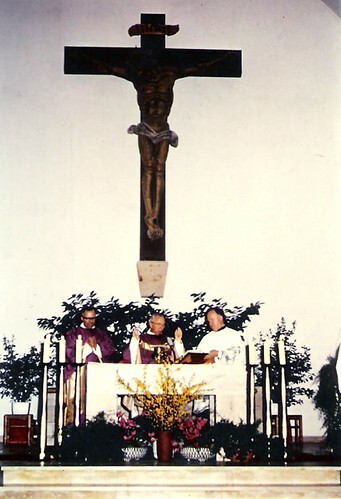 And again it is offered encouragement to all the religious, to those in consecrated lives – those who have dedicated their lives to Jesus, many of these people that their world have disappeared; that the meaning of their life is of no value but they are not understanding that they are closely bonded with Jesus, and they cannot fail but do good. Yes, maybe to all individuals, we don’t all have to be converting the multitudes but in individual personal encounter with people you are having an enormous impact in the world. So religious, you may be getting old in life, you may be not be able to do or you may be not achieve what you have set out to do but you are there fully a missionary, fully a representative of the Lord today. 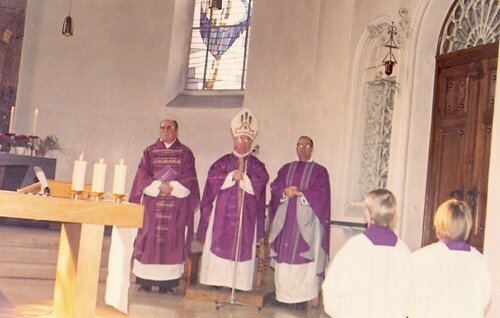 Having moved on from the family, the Bishops message of the parish, quoting Pope John XXIII who called the parish Church, “the village fountain, the village well”. In the old cities you will find it in dry lands like in Israel you go to Nazareth there is a beautiful well there where it is said Mary in fact first encountered the angel Gabriel. However, the well is the central village life in the old days. The parish is in a wonderful way “the village fountain” where people come to be refreshed by their sense of community with each other. And so the priest then is invited to deepen hi spiritual life, this is crucial. It is true; today we are speaking to every Christian person. You are a witness of Jesus Christ! You are the channel by which Jesus touches other people but in the structure of the Catholic Church and indeed of other churches, too, today. 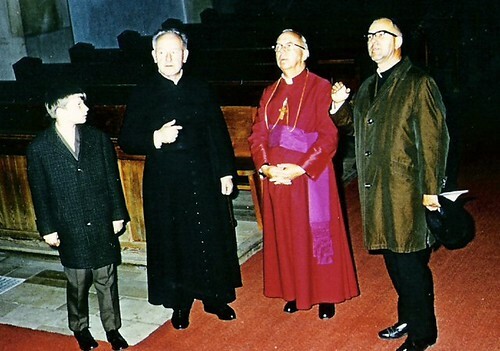 The priest is a crucial factor and so the priests – the bishops begged them to deepen their spiritual life. Do what we’re doing out of deep spiritual experience. You priests have been offered a tremendous formation of eight or more years and hopefully in that human formation you have become human and understood the human values of transparency and honesty, of reliability, of trustworthiness, of goodness, of generosity towards others, to have the ability to forgive. Hopefully, you have encountered Jesus. You have been evangelised. Yes, priest! We cannot presume that you have been evangelised. You, too, must examine yourselves and become evangelised to meet the Lord; and then you will have zeal. And then you will care about people; then you will not charge money to go to the hospital, or go to the funeral, then you will go out of love for people. Again priests, you are shepherds. Go after the poor and the abandoned. Who’s caring for them if not you? And so to the Laity and the Catechists, and finally, the bishops speak to youth and telling them that, “We are concerned for youth. We love the youth. But we are not pessimistic about you, concerned yes, but not pessimistic about you. Why are we concerned? Becauseso much of the evil in the world is directed in your direction. Through the media, through the advertising, thought the bad company, through so much evil in the world. It’s inviting you to dissipate to waste your energy, your youth and your joy. It is a pity that your youthfulness is wasted on the young. And in fact, so many things in the world are inviting you to become destructed; to go out other roads; and so we are concerned but not pessimistic because deep in your heart is the presence of the Lord. Time and time again in the Synod of Bishops it came back to the fundamental point of prayer – contemplation prayer is absolutely essential if the Church is to come alive. So I do invite you to pray in silence to adore the Lord, to restart again a life of prayer. Just a few moments of awareness of God, a few little prayers that you learned as a child pray them and pray them from your heart.